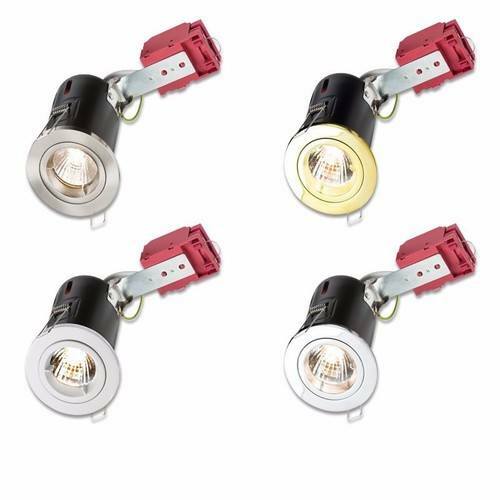 The Knightsbridge IP20 Die Cast Fixed Insulation Compatible Fire Rated Downlights with Bezel are compatible with GU10 Halogen, LED and CFL Lamps up to 60mm Depth. These downlights are sure to bring style to your lighting solution. Featuring a twist and lock front ring for easy lamp replacement. Compatible with all standard GU10 Halogen bulbs and ideal for all retrofit LED and CFL Lamps up to 60mm in length. Featuring easy to change or replace screw-in bezels, making these fixtures simple and reliable to use. This new Insulation Contact rated downlight complies with the new amendments to building regulations, regarding thermal gaps in insulation. These fittings, when installed with insulation above, are designed to have the insulation run right over the top of the fitting. The vent holes on the side of the body of the fitting will be sealed by the expanding in tumescent material should there be a fire. Electrical termination via 10 Amp connector block within secure enclosure c/w cord grip. What I was looking for at the right price.